Have you ever smelled fresh lemon balm? Nibbled a fresh leaf or tasted lemon balm tea? It is tastes absolutely delicious and smells divine. To me it is the smell of happy. Our preschool has a lovely, lush patch of lemon balm growing right in the backyard. We made good use of it last week on lemon balm day. Lemon balm makes a super tasty tea or infusion that is a pleasure to drink for most folks. I usually make the tea for kids rather than a stronger infusion. It is simple to make some lemon balm for your kiddos. Just steep 1 tablespoon of dried lemon balm leaf to each cup of just boiled water. I usually make at least a quart jar full of this yummy tea using 4 to 6 tablespoons of lemon balm in a quart jar full of hot water. Give the lemon balm at least 30 minutes to release its goodness into the water then strain out the herb and serve. Our tea tasting at school was a great success with almost every child clamoring for more tea, exclaiming, “I love it!” Even the kids that were skeptical at first enjoyed lemon balm tea once they had a taste. Blessed such as we are to have such an abundance of lemon balm in our backyard, I brought in a big bunch of it for us to play with. We sat in a cozy circle, each child smelling the lemon balm while feeling the square stems and noticing the opposite leaves. The kids recognized the lemon balm right away after having tea together early and said the smell made them feel happy! I was so impressed and pleased that little 2 ½, 3, and 4 year old kiddos remembered characteristics from the mint family which we had explored the week before. “What does it mean that the stems are square?” I asked. “What about the opposite leaves?” I asked. We talked about how lemon balm is like mint’s sister or brother. They are in the same family. Different yet similar like a brother or sister might be. After our spirited discussion we were ready to get down to business. I wanted the children to have a chance to get really hands on with lemon balm, to really experience it and to continue our learning about plants in the mint family. So we made lemon balm poundings. Pounding plants brings out the plant pigments, such as chlorophyll, and the fragrance of the plant. It also gives an interesting visual record of the plant. We were able to get prints of the square stems, opposite leaves and even flower heads. To make these we taped a lemon balm sprig down on one side of a piece of paper and then folded the paper in half covering the lemon balm. Next the kids used little wooden playdough mallets to pound the lemon balm. We stopped every few moments to check out the progress. It was really neat for the kids to see the chlorophyll coming out of the plant and printing on the paper. The scent of lemon balm filled the air too as the pounding progressed and essential oil was released from the plants, yum! 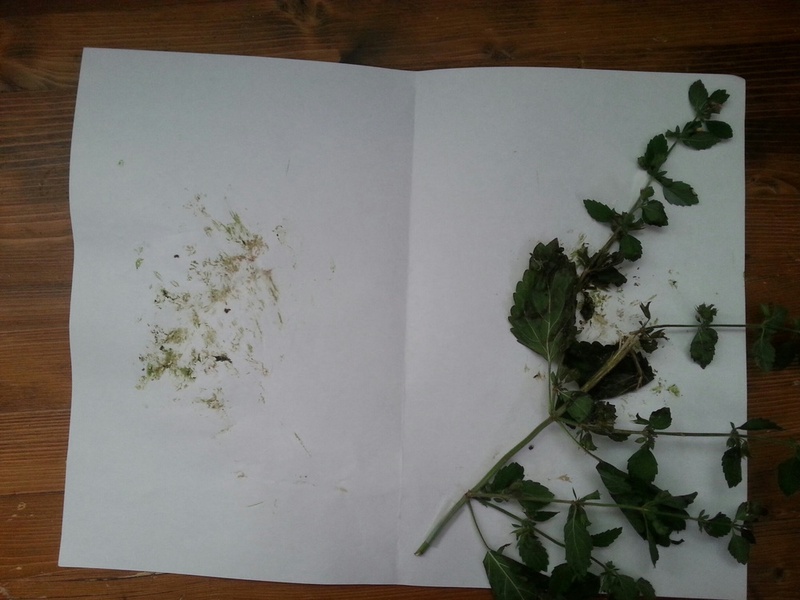 The children took home their lemon balm prints to share with their family and friends. * A Note: You can do this project with any fragrant plants you have available. I bet flowering lavender would be beautiful. Learn More About Lemon Balm Here! 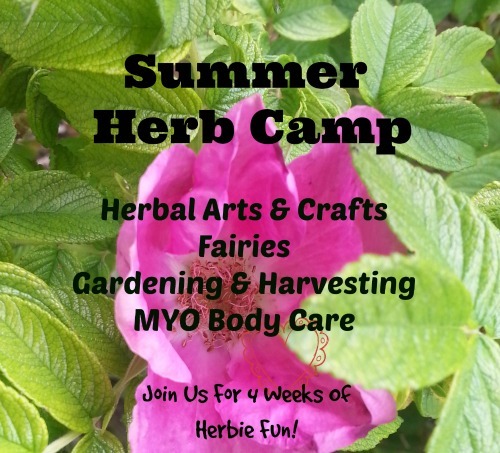 Visit my page, Herbs For Kids, to find lots of ideas for exploring and using herbs with children.